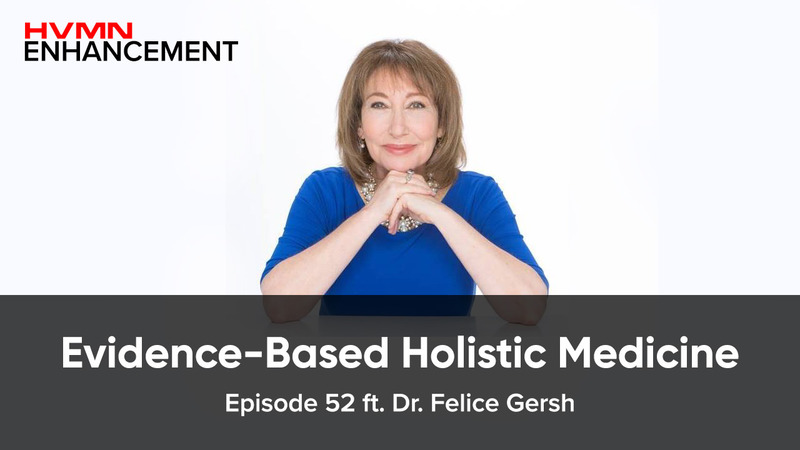 Dr. Felice Gersh is an established doctor that integrates both traditional and alternative medicine to assist and heal her patients holistically. We discuss the importance of human rhythm (circadian, hormonal, etc), the research behind more alternative interventions, and how the doctor-patient relationship needs to be reworked. Geoff: Welcome to this week's episode of The HVMN Enhancement Podcast. This is your host Geoffrey Woo, and I'm really excited to have Doctor Felice Gersh on our program today. She has been a well-known practitioner both of OB-GYN and integrative medicine over the last 20 ... 30 years now, and has delivered dozens of babies in Orange County, but has recently moved into integrative medicine and really looking at longevity and in wellness broadly. Let's dive into it. We had spoken a little bit previously before, but I think it would be great to talk about your background as a medical expert. How did you go from being OB-GYN and delivering babies into really scoping out and looking at human performance and longevity broadly. Felice: Well, I'd actually always been somewhat involved in what would be called the alternative medicine world. In my practice from the very beginning I had onboard as an ancillary to my services a Chinese medicine practitioner, who did Chinese herbal medicine and acupuncture. I had biofeedback specialists, I had psychologists, I had nutritionists, I actually had a whole array of these alternative practitioners working with me, but I myself had no specific training except in the conventional medical world. For many, many years I delivered, like you said, thousands of babies and I did thousands of surgeries. I was very conventional, but I knew that it wasn't enough, but I didn't take the deep dive until after I stopped doing obstetrics, and that was 10 years ago. Suddenly out of the blue I had a little bit more sleep, a little bit more time, and I demanded that all the pharmaceutical reps who paraded to my office on a very regular basis, to show me their studies, and to show me what made their drug actually useful. I was shocked to see what I found, and I found that they often deviated almost minisculely from the placebo effect, and sometime I wasn't quite sure that they did. The side effect profile was horrendous and I looked at it and I said, "How could I justify giving this drug for this little bit of benefit with this array of side effects?" I felt really lost, I didn't really want to just do end stage disease and take out disease organ. We had this crazy protocol in obstetrics and gynecology, it was like, "You have fibroids, we'll watch them, and then when it gets really bad we'll cut them out, and it would be like endometriosis. Well, we don't know what to do, so we'll just take all your hormones away and then we'll just things out." It was like, "There's got to be a better approach than this. This is not giving me joy. I don't feel like I'm doing things that are useful." I went on my own personal journey and I started taking random courses with this group of practitioners that I had never heard of call Naturopathic Doctors, and I said, "Who are these people?" They have a totally different philosophy, it's of the doctor is not the healer, the doctor is like the teacher and the guide to help people to find what they need to allow their bodies to heal themselves. This really resonated with me, it's like, "Yes, I can't heal people, I have to find the tools to allow them to heal themselves and I don't have that." I kept going to more and more conferences and I was just randomly taking things. I was learning, but I didn't have any structure. At one conference it was one MD in this entire room of naturopaths and myself, the other MD and I went up to her afterwards and I said, "You and I are the only MD's and I'm so lost. I don't know what to do to really feel good about myself as a doctor." She said, "In two weeks we start the next class, the fellowship in integrative medicine at the University of Arizona School of Medicine." She said, "You know you're qualified. Just apply." I went home. I was in Portland, Oregon, I flew home, I filled out the application and two weeks later I was in Tucson, and I started the two year fellowship and I finished it five years ago. Since then it's been an endless journey of additional learning. Everyone who finishes the fellowship goes in a certain direction that say, "No, that's not the end." Some will learn healing remedies like homeopathy or healing touch or massage or aromatherapy, and I know about those, but I didn't do the deep dive into those. What I did was I went more in the direction of functional medicine. I really wanted to know how does the body work, because so much had changed in terms of the knowledge-based since I was in medical school. I had to learn and relearn just about everything, like how does the cell work? What is biochemistry? I just have been learning. Geoff: I want to ask about this because that's a very interesting background, because I feel like the most of the naturopaths or alternative medicine practitioners want to be associated with classic, traditional medicine or Western medicine, and get the credibility and the rigor of Western medicine. It seems interesting that you started from a very rigorous Western medicine training and going into what is a little bit more alternative. I'm curious from your perspective, obviously we don't want to paint overly broad strokes here, but the critique on alternative medicine or a naturopath is that they're pseudoscience, is that they're not really well-grounded in science. How are you as someone who's classically trained as a doctor, how do you navigate that? Are you picking and choosing, "Okay, this stuff is actually legitimate and it has good data," versus, "Uh, homeopathy, um, maybe, there's no data there," how do you navigate the good stuff and the bad stuff within this crazy field of alternative medicine? Felice: Well, I actually consider myself extremely evidence-based in the things that I choose, but I also ... I have a much bigger, like what I will consider evidence than maybe a placebo, a double-blind placebo controlled trial, because that does not work for most everything except a drug, that's the thing. I believe in observation, experience, I look at that as also part of evidence, but I'm a little bit looser than, "It has to be a placebo double blind controlled trial," but I don't use things that I feel are not really tried true and evidence-based. Part of the difference between me and a lot of the naturopaths is the way I really have researched and learned about cell biology and biochemistry, and I really try to take what a lot of them do and I work with two, who I love, but I take a lot of what they do and I try to find the science to really explain it. Geoff: With the touch points, right? They might not necessarily be ... It sounds like nutritional Chinese medicine practitioners might not have ... The astrology or some of the pseudoscience associated with it might not necessarily be the mechanism, but there is some notion around certain points within a muscle that release stress or hold tension. It seems like there's definitely a merging of ... The way I think about this is that there's a ton of data out there, across traditional medicine to Western medicine, and people's folk practices and cultural practices, and if you're seeing signal again and again for something that's working, we should think of that as something that's at least interesting to explore and understand more, and of course some of these stuff isn't going to work, but some of these practices end up, do being really beneficial and very helpful. Felice: I work with some people that do things that other people who don't understand it think like woo woo kind of medicine, like earthing or now they're using the term more grounding. This idea that you can run around on grass and get better, but the reality is that we understand the science that the Earth can act as an electron donor and you can actually quench free radicals and reduce inflammation, oxidated stress in the body by connecting with our planet. The idea that our planet resonates with the same energy that our brains resonate with, I mean this is unbelievable connectivity between us and our planet, which isn't pretend, it's real. Geoff: Actually I was talking to Deepak Chopra and it sounds like he's very involved in looking at grounding, and it sounds like he has a group of people actually publishing peer review papers around the effects of grounding. Felice: They are. They are. Geoff: I think ... Yes, one can take the spiritual approach to it, but there does seem to be something around the fact that, yes, there's potentially different electric charges between our bodies and the ground, and we can ... This is not my expertise area, but there is this ... there seem to be a physics explanation to why actually touching your barefoot to something conductive, like ground, might see some effect. Felice: Well, there was a fascinating article that also just about the connectivity of people as well, that when a baby, and this also works for adults, but the baby's brain is actually developing with this, that when the mother and the baby lock gaze, that they look at each other and they're actually looking directly into each other's eyes, their brainwaves synchronize. How amazing is that? That helps to actually have the baby's brain develop properly. Geoff: Then they're detecting this with EEG's. They're just monitoring EEG's. Felice: Yes. They're synchronizing their brainwaves. There's so much that we don't know that is not testable in the ways that we use to test things. I guess the way I approach medicine really from the beginning, is with a big open mind, like the whole universe is mysterious and I'm going to do my best to understand just a speck of it, the speck that I can figure out, and that's my fun journey. That's why it's so sad because, you probably know this, but 60% of doctors, and it's probably more because it's always underestimated, suffer for what they label burnout. They hate going to work. They see patients as annoyances. It's like it's so terrible, I have to warn people like, "Beware the doctor you're seeing has a high probability, more probable than not," as we say, "that, that doctor is suffering from burnout and will not listen to you." It's really very hard to tell people that because they want to trust their doctors, but you have to find doctors that are not burnout, that loves what they're doing. Geoff: No, it's really refreshing, absolutely refreshing talking to you. I think you can clearly sense the joy and energy coming from describing your work, and I think end of the day it is about open-mind and curiosity. It just seems like I've talked to multiple doctors and there seems to be a lot of frustration with this system of how doctors and healthcare insurance, and how the financial incentives are structure in a way, where this is not like a conversation you have between a doctor and a patient in more of a coaching relationship. It's very much an ivory figure ... in an ivory tower that's a master telling the student, "You must do this. Here is this prescription. I only have time to talk to you for five minutes because I have to talk to the 17 other people in my waiting room, and I have to like churn out because I have to my pay medical school debt." It's very understandable that, yes, that ... I think all doctors, I think, come into this space wanting to ultimately help people and I really believe that. It's a shame that some of the institutional frameworks have beaten that out of a lot of people that are practicing doctors. But I think it is refreshing, I think you are able to, I think, go in the system and successfully delivered thousands of babies and do thousands of surgeries, but also still keep that curious, open mind. Felice: Well, I had my own, what I would call a nervous breakdown, in fact, quite a few years ago, because I couldn't take it anymore. I would have had burnout, but one day with no thought, no plan, nothing, I fired all of my insurance carriers that I had contracts with. I said, "You know what? I can't work with them. They cannot rule me. I have to have a relationship with my patient and that is the primary point of why I go to work everyday. I cannot be beholding to an insurance company." I just fired them all and I said, "You know I'm just going to charge reasonable rates and I'm just going to be an outlier." I guess I've always been something of an outlier, now I'm more of an outlier because I can't practice with those constraints. I know that you're kind of an outlier because the little bit I've learned about you, Geoffrey, is that you forged your own path when it comes to your own health. Geoff: I think that's a broader populace movement within healthcare. I think you see this happening with internet technology, where there's more and more information available to the entire world. I think you see similar patterns happen with cryptocurrencies, with populace movement within financial systems, and I think you see that happening now with biohackers. I think just everyday consumers or our patients really getting up to speed on their own health and taking responsibility for it, and understanding your biomarkers, understanding how to manipulate. I'm curious, does that seem to be reflective in your patient-base, in your experience? What has been an interesting or what patterns have you seen in your practice as you move from an OB-GYN focus to more of an integrative functional practice in that recent five years? What things are interesting? What are the most popular interventions? I know we had talked about fasting and circadian rhythms, and we talked about the pros and cons, and perhaps some of the pitfalls one might encounter. I'm curious as you're moving into this new part of your practice, what has been some of the most interesting experiences so far? Felice: Well, in terms of the relationship I have with my patients I look at myself as like a consultant. I'm not their boss, I never think that, and I have the most wonderful patients who bring me information as well. We work really as a team, and I encourage my patients to read. We live in a world where doctors are not, like they have secret language and a secret set of code books and things, everything is open. Everything is open source, and I say, "You know what, if you want to research this on PubMed, and you could become more expert than I, great, go for it." I don't think of this as a secret society of medicine, and I love it that it's sort of open source, and everyone can look out for themselves and research and so on. For myself, what probably got me the most angry and then excited in other ways, was the Women's Health Initiative that came out way back, and then was terminated in 2002, where they said that ... basically their conclusion was that hormones are evil for women. It was so crazy, it's like, "Wait a minute. I know what hormones do, how could they be good one day and then evil the next? How could they be good for one woman, who is still pre-menopausal at age 52, and another woman who went through an earlier menopause at 46 say it's bad for her at 46?" It didn't make any sense at all. Then I looked at, "Well, how did we even give hormones to women, when we gave them and we still do?" This is a standard of care. It's like, "Wait a minute, but women are rhythmic," and I started, "Wait, but we have lots of rhythms." It got me into the whole world of human rhythms and that's really one of my passions now, looking at circadian rhythm and lunar rhythm, and even seasonal rhythms. Men have rhythms too, like men's testosterone level is lunar. It's so amazing if you have a man and a woman together, and the woman is not on birth control pills, which changes, that's another whole big issue, but that changes everything, but if she has natural hormones and he has natural hormones, they actually synchronize. The woman's peak of estrogen then upregulates her testosterone receptors, and then she actually has a spike in testosterone, and the receptors are more receptive, and the male will peak his testosterone production at the same time. Felice: That's the amazing synchrony of people living together. Geoff: Is there published data on that? Geoff: That's interesting. I think I've seen the data on groups of women living together will synchronize their menstrual cycle, but that's interesting to see that also crosses over into a man's testosterone cycle as well. That's interesting. Felice: But think, Geoffrey, they're not ... Women are not supposed to be synchronizing to each other in a random fashion. They're actually supposed to be synchronizing to the moon, and you probably heard that a moon, a full moon is romantic, right? Felice: Well, why is a full moon romantic? Felice: Because in ancient times men and women both spike their hormones, their testosterone at ovulation time, and women ovulated on the full moon. Women were designed to be synchronous with their solar system, with their planet and their moon, but in the absence of that, when we live indoors, and we're secluded from the world outside and we don't see the sun, the moon, and the stars, then what happens is the dominant women will become the one that the other women will synchronize their cycles to. Because they're all supposed to be in synchrony, and all women would have a period at the same time, they would ovulate at the same time, and it was with the moon. I know it's amazing. Geoff: That's interesting. If one were, one of the testers in a science experiment then one would essentially randomized two different groups of women, one indoors, one living a more traditional lifestyle with a lot of access, I guess to the sky and the moon. Over a certain period of time you would expect if this hypothesis proves out that one subsegment, the cohort would mirror the menstrual cycle to the lunar cycle. Felice: Right, that would be great. We should do that. Then this brings up the whole, like we had talked about before, about the whole issue of fasting and women and their cycles. If a woman is having a natural cycle, what's the data on what should she do and how does fasting affect her fertility and so on? There actually is some data on that. Geoff: Of course, it's been a very active area of conversation because a lot of more community members are women, and fertility is a big concern of how that might be impacted. I'd love to hear your experience and your understanding here of how to best recommend and talk about fasting for our women biohackers out there. Felice: Well, I think the information is actually quite exciting in terms of how this can actually interrelate and actually be very beneficial for women, especially perhaps for women who have premenstrual syndrome, because I'll tell you how this works. The studies that looked at women who did 12-hour fast everyday, just today, everyday, and they looked at them through the menstrual cycle. The first part of the menstrual cycle before ovulation is called the follicular phase, and then from ovulation until the menstrual period begins is called the luteal phase. During the initial phase, the follicular phase, during that phase if they did the 12-hour fast they showed that they had increase in high-frequency ways. I'm sure you know about doing things like HearthMath and looking at brainwaves, if you do, the brainwaves, they found that they had more high-frequency when they did the 12-hour fast, which is good. It means that they're increasing parasympathetic, it's calming, less of the sympathetic. Felice: No. Well, in terms of ... You know, actually, what I can say that ... The way that the study was reported they didn't actually go into that, but they said, "Basically there was upregulation of the calming part of the autonomic nervous system, the parasympathetic." Sympathetic nervous system is what you would ... the bad part of this. There's the autonomic nervous system, which controls all the different functions of the body that you don't think about, like heart rate and sweating, and breathing and things like that, that should be automatic. It's autonomic, but it's like automatic. Then the sympathetic part is the part that would get you activated like you're stressed, you're anxious. Geoff: Because heart rate variability is also associated with ... an increased heart rate variability means better recovery and then it's a sign of parasympathetic action. Felice: Exactly, right, it has many effects. If you live and you're chronically in sympathetic upregulated tone, that means your blood vessels are constricted, you have high pulse, those are bad things to live with, because you don't want to be in a, basically a stressed out state. Think of that as sympa ... It turned out, and it's a sight not going to be so beautiful, that women who did 12-hour fast, they had more parasympathetic tone and less sympathetic. Basically it was a calming effect on the body, on the autonomic nervous system, and that went across both phases, the follicular and the luteal. It just made them calmer, that's better for longevity. It improved heart rate variability. The thing that was really fascinating is that in the luteal phase, which is the premenstrual phase, like women who get PMS really badly, it not only increased the parasympathetic and heart rate variability it also lowered their systemic cortisol levels. Geoff: Cortisol, for those that don't understand is essentially the stress hormone. Cortisol spikes when you're stressed, if you're lowering that, that's a fascinating result. Geoff: This is water fast, zero calories? Felice: This is all water fasting that they did. Zero calorie, water fasting for three days, and they did one, there was one ... These are actually different groups, but one did it in the luteal phase, and one did it in the follicular phase. What they found was that in women of normal weight, that if they did it in the follicular phase, a few days before ovulation, that what happened was their LH variability and surges were a little bit less. The hormones that come from the pituitary gland to simulate the ovary to make hormones and ovulate, they were a little bit suppressed, but not enough to impact on ovulation. They had perfect ovulation. There was an effect, but it didn't seemed to be consequential in terms of how the women actually functioned. They lost, the women who had normal weight actually loss body fat and they had improvement in a lot of their different parameters, but they did not suppress ovulation. They did not. In women who were underweight, they did suppress ovulation in a certain percentage, and they did have some alterations, and that actually cortisol rose, and that's bad, and you just talked about cortisol. what I would say is that, and this is in my own practice, I never do such fasting with women who are, like really, really low body weight. That's not for them, that is not for them. If you think of anorexic women, they're like fasting inappropriately all the time, that's what we don't want. Geoff: It's starvation. I think that's an important caveat, like if one is underweight already, do not fast. It's called starvation. Felice: That's right. This was great that it proved it, that it did not, and the same thing happened in the luteal phase, that they did better because it's already after ovulation, but that a woman can do this who has normal weight or overweight. Actually you have fewer studies on overweight, but we need to get more studies, but it did not ... The critical thing is that it did not wreck their ovulation, but it gave them all the benefits. It's just if you're underweight, don’t do fasting, but if you're normal weight or above, this is perfect for you. Felice: I can do that. Geoff: Because it will be helpful. Geoff: I think our community appreciates reading and diving into methods and the research, and the data and the raw data itself, but I think that's an exciting news because I think in our community there's been a lot of just debate back and forth. Again, I think you answered it quite clearly, with the result and the study you cited, the data seems to be quite good. I think, again, let's be evidence-driven and let's follow the data. The data seems to be positive absolutely. Felice: I think there is no reason for people, any woman not to get at least a 12-hour fast at night, because they can get all their nutrients in, they're not withholding any nutrients. That should be for any woman, and the idea that they're going to be calmer ... There's so many studies I wish we could do, because I'll bet they had better night's sleep, but we don't have that data. Geoff: Well, it's just interesting, I mean, 12 hours is not even that long of a fast, that's 9:00AM to 9:00PM, then you get to eat. It's just basically not being silly and having a midnight snack or something, right? Felice: But I have a rule, forks down at 7:00PM because your pancreas ... We talked about I love circadian rhythm, your pancreas is asleep doing other things, like repairing itself after about 7:00PM, 8:00PM at night. Even healthy food will stress out your body. We have lots and lots of data on people who are shift workers and women who are shift workers have much higher rates of breast cancer, depression, anxiety, and Alzheimer's, and metabolic syndrome. You just can't flip your ... This is embedded into our genes. One-third of all of our genes in our body are clock genes, one-third, and the ones that aren't relate to the clock genes. We really need ... We can't change it. It's like I always use analogy, here it's like, "I really could use another set of eyes on the back of my head. It would be so convenient, so I'm going to will it." It's not going to happen. You can't will yourself to have a flipped circadian rhythm that you can work all night and sleep all day. It won't happen. You will be unhealthy. You cannot change, that is so ingrained into our genetics. Geoff: Absolutely, I think the data is very clear there. The sun is such a potent signaling factor for so many different metabolic pathways. Look at the curves, testosterone, growth hormone, Ghrelin for appetite, Insulin, these are all spiked according to a daily pattern, and usually the anchor is the sun. If you shift, if you live in a box with no sun, and I think that's why these things started getting out of whack. It is important to reflect it back, at least understand how these things work, and one, make sure you're not throwing them out of whack, and two, can we optimize our schedule around these natural rhythms? Felice: One of the things I ... One of my other areas that I've been really getting more and more expert in, I've always had more to learn, is the world of the environmental toxins that we live in, and how that impacts on us. Just in terms of the circadian rhythm, the estrogen and testosterone have receptors on the master clock, that sits atop the optic nerve in a place in the brain, in the area of the hypothalamus called the suprachiasmatic nucleus. There are actual receptors in the retina of the eye that perceives light and the signal directly goes to that master clock and nowhere else. That's how important the entrainment would light is everyday exactly, but the master clock cannot properly work without hormones like estrogen and testosterone, they're both key. When you, of course age messes us up, and we can talk forever about what happens to sleep in older people, and how they wake up often at three o'clock in the morning it's like, "What's happening?" That's called a phase advanced, and that's because their circadian clock is messed up and hormones can often help that, but if you live, even at a young person. A young person lives in a world of endocrine disruptors, bisphenol A and phthalates, and heavy metals that act as estrogen endocrine disruptors. Geoff: Well, even light pollution, where you just like look in a cellphone. Felice: Oh my God, yes. Geoff: You're just reading your iPhone right before going to bed, and that blue light hitting your optic nerve. Felice: I know. It's so big, there are so many things working against us. Felice: Endocrine disruptors, light pollution, and I hope you have a set of amber glasses. Geoff: Yes, it's in my desk over there and I have my bedroom blacked out as much as possible. No ambient light and I also have a real sound generator to throw some white noise as well. I have my ... I am optimized. Felice: I sleep actually with nightshades now, because I cannot get the ambient light out of my bedroom well enough. I just wear black covered googles, essentially to cover my eyes. They're actually pretty comfortable, I got them on one of those long distance flights, where you get this, so you can fall asleep on the plane. I just do it now and I sleep much better. I hope everybody realizes how important it is to sleep in a room that's cool and very dark. Geoff: Before throwing you offtrack there, I mean, what is the data around phthalates? We've all read, perhaps maybe the overly scary articles for there's a pond of frogs and it all turned female because of plastic poisoning. Then there's some debate whether that's a tall tale or whether that's real. I'm curious, can you break that down for us? What are the biggest environmental factors have you seen, that's we should be most concern about? How do we stay away from them? Felice: Oh my gosh. So challenging to stay away from the air we breathe, and here in Southern California with the fires, and also Northern California with the fire. It's not just the particulate matter, which is horrible and dangerous, but now when things burn up, of course you get in all the toxins from the flame retardants, and all the other toxic chemicals that are used in building materials. Everyone should have a really high-end air filter. The ash and everything, it's all getting into our reservoirs, and into the groundwater, everyone needs to get a really high-end reverse osmosis water filter. This should be standard now, every home should have this, and you can get the reverse osmosis water filter just for your sink and your kitchen, at least the main water that you drink, and you cook with is from that. You can then take some and you can bottle it yourself in your own glass or stainless steel water containers, preferably not plastic. That's a very big thing. The water that is going ... that's in our lakes and rivers now is a problem, because the water treatment plants were only designed to deal with the bacteria, and pharmaceuticals are just getting into our water supplies like crazy. They say they should put Prozac and everything. Felice: But they're not even that, they're really ... If you go to Medline, you'll see that, or the US Toxicology site, website, they lists the chemicals that are in birth control pills as endocrine disruptors because they're really not estrogen, and they're really not progesterone. They're really chemicals, like bisphenol A it's first approach was to be a pharmaceutical. Bisphenol A, which is a known endocrine disruptor, it wanted to be a pharmaceutical, to be a pretend estrogen. Well, it lose out to Diethylsilbestrol, which caused havoc and horrible things in pregnant women. Another whole story, but the chemicals that are in birth control pills are not hormones. I just want to ... That's one of my missions, is to change people including doctors from calling them hormonal contraception to calling them endocrine disruptor contraception, because that's what they are, but they are getting into the waters, and Phthalates, which are ... people think that they're okay, they don't even ... really it's what they're doing. Geoff: It's actually interesting. In medical school, literally the reference range has dropped by 3X since that's ... I've seen some articles about that and it seemed like ... but that's interesting, that literally the reference range as taught has been dropping. Wow. Felice: Right, that's why you have to be very careful. This is a very good clue for people. When you look at a lab, a lot of times even doctors they say, "It's in the normal range," they don't list them on the lab form as normal range, they're called reference range. That means that they tested like 2,000 to 3,000 random people, and the two and a half percentile and below is the bottom number, and two and a half percentile is the top number. You're talking about 95% of random people. The fact that you fit into that range doesn't mean a darn thing, it's really about what's optimal. I tell people, "If you have no clue what's optimal just think, 'Is this something you want or don't want to have a lot of in your body?'" Like you don't want to have a very high levels of liver enzymes, that would go along with having liver disease or hepatitis. You want to be in the bottom half, but you don't want to have low thyroid, so you probably want to be more in the upper half or for a nutrient, you want to be in the upper half. Geoff: I think that's a great point that you bring up, that the typical reference range is just a random sampling of humans, and if you look around in America today, half of Americans are obese if not overweight. The diabetic, diabetes charts, all the metabolic syndrome rates are skyrocketing. If that is the reference that you want to be comparing yourself against, that is not the range you want to be comparing yourself against. It's refreshing to hear from a medical doctor's perspective that we can actually know what the reference range is about, and it's not this magical healthy range, it's a range that is a guide and we can be optimizing towards a range with a doctor or with self-education one can actually manipulate these biomarkers in a way that you see fit for your intended use case. Felice: Right, and I'm a big tester. I love getting information on people, it's so totally non-invasive except for poking their vein. There is so much information that we can get on people. One of the things that is very popular now is getting calcium scores for people's heart to look at, but I'm not really big on calcium scores for a few reasons. One, I'm so anti-medical radiation except when it's absolutely necessary. One of the things that happened in my practice years ago I did mammography, and I did bone density, which I don't do them in my office any longer, but in order to do that I actually had to have a radiation supervisor license, which meant that I had to have the same qualifications. I had to take this multi-house tests, the same like if you were running a CT center or an MRI center. It's the same. I had to memorize a book that was like six inches thick. I think in hindsight I don't know how I did that, but I did it. In order to maintain my license as a radiation supervisor I had to do a lot of continuing medical education every year. Since I was not running CT's or MRI's I didn't really want to learn about the technical part of running them. All the education I did was on radiation safety. It's like every year I had to do like 20 hours of radiation safety, and I kept reading like, "Oh, this stuff is really dangerous," like, "Why are we doing so many CT scans on people?" As you probably know you walk in an emergency room and you have almost any complaint they want to get a CT scan on you, and they never ask like, "Well, how much radiation have you been exposed to in the last year or in your life and so on?" They're now estimating that something like at least 6% of all cancers in the country are induced by medical radiation. I'm figuring like for a heart, there are so many ways that you can know about the status of your arteries without having to do a CAT scan of your heart, and even though it's a low dose CAT scan it's still a CAT scan. You can do lab tests, inflammatory marker testing and you can know about so much, because we now know, and this is one of my pet peeves is looking at cholesterol and saying, "You have high cholesterol, go on a statin." A high cholesterol is a symptom. Now if you have oxidized cholesterol, and we call oxidized LDL, that is what can harm you. We don't want oxidized, it's like rancid. I use the word rusting, because oxidation is rust. Think of it, do you want to be rusting inside? People can picture that because they don't always understand like free radicals and that sort of thing. You don't want to have cholesterol that gets rancid, because everybody knows what rancid means, but if you don't get oxidized LDL that's the only kind that gets into an artery, that can cause plaque. Just cholesterol does not ... Nobody dies of high cholesterol, it has to be oxidized, and in fact when you get elderly they've now shown that people with very low cholesterol have a much higher mortality rate than a high cholesterol, because cholesterol is key to cell membranes. Cell membrane, which you need to have a functional healthy cell. The cell membrane is what allows everything to be transported in and out of the cell, so it can function, it lives, and the brain is so full of cholesterol, and of course your steroid hormones. Low cholesterol is terrible, and I have to tell people out there, "That's why I'm not in favor of veganism because people who are," I hope you're not a vegan, I never asked you. Geoff: I'm not a vegan. Geoff: No, we should talk about that data. I mean, I think no one should be dogmatic about it, if there's an interesting data around a certain practice, there's pros and cons debated out. I think if one is so adamant around veganism, well, they should be able to respond. That should be the way to think about it. Even if I were a vegan I'd love to hear the response of ... because I think we've seen the data around ketogenic diets and some of the critique there is that you might be able to ... you're raising your LDL C levels, but is that necessarily a bad thing? I think there's an interesting active area of debate and research around, and I think as you're referencing that maybe the LDL C levels themselves are not the root cause, it's a side effect. That is not necessarily causing disease, it's just a side effect of that diet and they also just need it for a lot of just normal metabolic function. Geoff: One of the biggest controls of oxidative stress is refined sugars. I think the worst is when you have a lot of refined sugar and a lot of fatty foods, and you have high cholesterol. I think that is a pretty, I think consensus argument that, that is a really, really bad combo. Felice: Getting back to the circadian rhythm, there is data that people who eat a high-fat, a bad high ... a bad fat, high-fat, high-sugar diet, it actually changes their microbiome in very bad ways, which actually correlates because the microbiome has its own clocks. There are two ways that the body maintains the proper circadian rhythm, one is through the master clock, the other is through the clock in your microbiome, which then directly communicates to the liver. There is a direct communication between the gut microbiome and the liver through the short-chain fatty acids and the portal circulation, and this then, when you have the livers clocks get all off kilter, then the liver goes into a state of uncontrolled gluconeogenesis. It just starts pouring out sugar, and then it just feeds the whole diabetes thing, but they've shown that the clocks get out of sync. You alter your circadian rhythm when you eat the high-fat, high-sugar diet. Everything goes back to circadian rhythm again and the beat, to live with the beat and so on, but absolutely your diet is key to virtually every function in your body. The thing that happens with the vegans is that they don't have enough saturated fat. You don't need a lot, that's the thing, like I eat a very small amount of animal protein, but you need some, and you need some saturated fat for having proper function in the body. You need to have cholesterol. A lot of vegans they're so proud of their very, very low cholesterol, but they're forgetting that cholesterol is so precious to the body, that the body has a recycling system in the gut to pull the cholesterol back in, because it loves cholesterol, it needs cholesterol. You have some pharmaceuticals, which actually did work very terribly to try to bind the cholesterol and then pull it out, so you couldn't recycle it back in, to try to lower your cholesterol that way, but it's all approaching the whole problem from the wrong perspective. Because it's not that we don't want cholesterol, we want to work on stress because think of it this way, if you have high cholesterol that is a sign that you have high stress in your body, because remember cholesterol is the foundation for making cortisol, the stress hormone. Your body says, "Oh, stress, stress," more cholesterol to make more cortisol. You have to find out what that stress is, that's how you go and you're on a detective mission, because you have to find out if someone has high cholesterol what is stressing their body, that their body is ... Remember, everything in the body is doing what it's designed and programmed to do. If your body is making too much cholesterol it's because it perceives a stress and it has to make more cortisol. Then you have to go find what is the stress, it could be a myriad of things. It could be you're not getting the right nutrients. It could be you're eating toxic food that you have poison in your life, in every area. You're breathing toxic air. You have too much light pollution, noise pollution, not getting enough sleep, of course it could be so many things, but you have to address the cause of the stress, which then creates oxidative stress, and in turn will help you to have a more appropriate cholesterol, and reduce the chances of oxidizing that cholesterol, and then creating atherosclerosis. I always tell people too, "No one dies of plaque." That's a whole other crazy thing. You don't die of plaque, you die of ruptured plaque, and the plaque that ruptures is usually the thinner plaque, like the 40%, 50% plaque. They're going on this wild goose chase, always looking for 80% blockages. Well, those are usually not the ones that kill you, because they're usually made out of plaque that's like stone. They usually don't rupture. Felice: They're calcified. That's not the plaque that kills you. Now what happens is if you have a plaque that ruptures that's upstream of that area, and then the blood clot that forms breaks off, that's how you can die and get a stroke or a heart attack. You have ruptured plaque, the body does its thing, it tries to heal it, it creates a little scab, a little blood clot, but then if that blood clot breaks off it travels downstream, and then where is going to get stuck? Where that 80% blockage is. It's not the 80% blockage that's causing the heart attack directly, it's just that's where the blood clot that broke off from the 40% plaque got stuck. Felice: But it does…people don't get a heart attack because their plaque got to a 100%, they die of a heart attack because a different set of plaque ruptured and then the clot got stuck at that 80%. Felice: They're like opening that does ... that only reduces mortality if you're in the middle of a heart attack, and that's where the blood clot has lodged, only if you're in the middle of heart attack or you have acute coronary syndrome, which is like a precursor to having a heart attack. But if you, and this is especially bad in women, if they go in and they put in these stents in women, in their coronary arteries, that actually has no impact on their long-term mortality, but there's a high risk that they're going to break off plaque while they're trying to put in, because women have much ... Women's heart and men's heart are not the same. I always go that women are not just small men, they really have unique physiology, really. Felice: They have different immune systems, we're very different in a lot of ways, and we have hearts that are quite different. Our coronary arteries are much smaller caliber, and we tend to have more small vessel disease. We can get little plaques build up and then we can get what's called Broken Heart Syndrome. We get stress and we get spasm of our arteries. About half of women who die from heart attacks don't even have really high levels of plaque, they have some plaque, but they're very sympathetically upregulated. This is where the fasting can come in, because we talked about it, that when you fast, in women they lower their sympathetic tone, which causes constriction of their arteries and they become more parasympathetic. Because women die from spasm of their coronary arteries even with very small amounts of plaque, and they can literally die. Then if they don't die they can get what's called cardiomyopathy, where the heart muscle is actually dysfunctional and they call that, there's other names for it, but the common name is Broken Heart Syndrome. That's how emotions, like when people die suddenly of a heart attack, they didn't just suddenly grow a 100% plaque, they didn't do that. They got a spasm, and I tell this to everyone. There are key things that you have to do, and then there are things that are important, but if you don't address the key things, all the other things will never really fix you. Felice: You have to put yourself in a good place. You have to have reasonably clean air as best you can get, that's why you get an air filter and water filter for your home. You have to be around people who are not toxic to you. You have to deal with removing the toxins or the toxic people from your life. Geoff: If someone's toxi they're going to make you stressed out, you're going to raise your cortisol, all the stuff. Again, it's a real physiological biological phenomena, it's not this woo woo, "Oh, bad energy vibes," no, people can stress you out and that causes real chemical cascade. Felice: We know that children who grow up in toxic environments, toxic with people where they have abusive parents and such, they're actually epigenetically altered. Their bodies don't even function right, and that we don't know how to fix that. We can work with it, but it actually changes everything. Geoff: It changes genetic expression. I think and one of our staff scientists is actually doing his PhD on PTSD, epigenetically changing DNA expression. This is not ... This is showing up in academia. You literally change genetic expression with additional stress. Felice: Conventional medicine has not addressed this at all. Conventional medicine almost never ... If you go to your family doctor they're not going to say, "Well, let's really look at your toxic exposures." They don't like to even look at anything, they don't think about the air you breathe, the food, the environment, like where do you live relative to the freeway. Geoff: Why do you think that's happening? I've talked about this before, but it seems to be that insurance companies don't pay for that, and doctors need to get paid and you need to fill insurance. You have to have a code that you can write in the insurance forms to get paid. The system doesn't let you to actually find the root cause. The system allows you ... makes you ... incentivize you to pay for a prescription. Felice: I think that's why there's a whole Netherlands Group of Healthcare Practitioners that are growing. That people are searching everywhere for answers, because I see them in my office, they'll often go to multiple doctors and what happens is a lot of primary care doctors have turned into referral mills. It's like, "Oh." People, because they don't understand that you can have one problem, for example mold, you can have a mold problem and sensitivity, and that could manifest with headaches and gut problems, and skin rashes, and GI problems. You could have 15 different symptoms and then you go to the primary care doctor and they'll say, "Okay, I'm going to refer you to the rheumatologist and the orthopedist because your knees hurt and you have fibromyalgia, and we'll refer you to the neurologist for your chronic migraines, and the dermatologist for the hives that just never seem to go." Geoff: You have toxic screen. Felice: "Did you ever get your house checked out for molds?" It's like, "No," and then they bring someone in, they take down the wall, the whole thing is full of black mold, and they wonder why the whole family ... Look at the family, you have to take a family's history when you find that every member in the family is suffering with different odd symptoms. Whenever you have "sick family" you've got a sick house, they call it Sick House Syndrome. What's going on in that house? Also, have you had new construction? You're offgassing formaldehyde or whatever. People putting carpeting they think it's so nice, but they don't realize what it offgasses and so on, but the reality is that in our conventional system they end up seeing every different doctor under creation, and each doctor gives them some prescription. Geoff: It just clamps the symptom. It is not finding the root cause. Felice: Each drug then has its own set of symptoms. We know, you know we have an opioid addiction problem in this country of course, and something like ... in 2017 they're expecting something like 90,000 people have died from opioid overdoses. It's unbelievable. It's like more than twice the Vietnam War. It's crazy, that's one year in this country. The problem is that the modern science, what have they done? They created a drug for opioid constipation. It's like, "Wait a minute. We have to get rid of the opioid." Felice: No, we got to treat the constipation that's caused by opioid. Geoff: Instead of taking people off opioids. Felice: The problem is that people don't understand, the doctors don't understand that pain is a manifestation of inflammation. It's inflammation in your joints, like there's an epidemic of knee pain. It's like, "Why is everyone ... They keep thinking it's wear and tear, no, it's not, it's break down from inflammation. It's amazing, they have studies in migraines, people who have migraines. That you can put someone on a high, high plant-based diet, like 12 servings of vegetables and a couple of fruit a day for the short-term. I'm in favor of short-term veganism, like for maybe three to six months, because the gut can't really digest the animal protein when it has the wrong microbiome. You got to nurture your microbiome, and you can reduce pain by up to 80% in just changing the diet, because these polyphenols that are in different plants are like magic. They actually act as signaling agents, they help heal the gut. It's amazing because we now know that most inflammation starts in the gut, from what we call leaky gut, and then the immune system, which aligns the gut has all these immune cells that can produce what are called inflammatory cytokines, these burst of inflammation. These things circulate and they create inflammation everywhere, in the arteries, in the joints, in the nerves, and in the brain. Geoff: I was also going to say there's also an interesting data emerging on ketone bodies themselves, the beta-Hydroxybutyrate being NLRP3 inflammasome signaler. You're decreasing inflammation through ketones as well. It's an interesting way for phthalates and inputs can actually control inflammation absolutely. Felice: Well, that's why I'm very, very big on some form of periodic fasting, because then you do get that burst of the butyrate. Felice: Right, cancer, and you never have the pause to burn. You're always growing, but if you have the periodic fasting then you stop that. Geoff: Moses fasting for 40 days and 40 nights. Felice: It's so spot on. It's so spot on. Getting like to Chinese medicine, although they didn't understand the science of it, they somehow knew that the gut, the chi, that gut, and that the liver was so important, and we didn't understand. When I first started in medicine I heard about Chinese medicine, they talked about liver stagnation, I thought like, I was like science or like, "What the heck, liver stagnation?" Now we know that Parkinson's disease is due to environmental toxins that the liver can't detoxify properly. Yes, the liver, you can call it stagnation or just malfunction or whatever, the liver isn't able to properly detoxify the toxins, the overwhelming load of toxins that we produce in our own bodies, plus there are exposures. Then people, it creates leaky, you have leaky gut, you have leaky brain, like the blood brain barrier is not holding and you'd get these toxins passing into the brain that poison the brain, and you get Parkinson's. The Chinese had it right like 2000 years ago, and so did in the biblical times about there's a time for this. We somehow lost our way. Modern medicine lost its way with the rise of big pharma, and the thing that I emphasize over and over is that we are like little know-nothings. The body is so unbelievably complex, we cannot micromanage the body by blocking major pathways and enzyme systems. That's what pharmaceuticals tried to do, because nothing is single tasking, and nothing is in one space. Whenever you give a drug that blocks the ... I have patients and some doctor gave them Aricept, because they think they're early Alzheimer's. That is to try to increase acetycholine, that's it's goal, it doesn't really work, but that's it's goal. Geoff: Is it acetycholinesterase inhibitor? Is that what it is? Geoff: Inhibit the breakdown of acetycholine. Felice: Right, but they don't realize that histamine is a neurotransmitter that helps to set memories. You're increasing your risk of dementia if you live on antihistamines all the time, because it's not like histamine is doing one thing in the body. Histamine is packaged in these immune cells called mast cells, and when the immune system is dysregulated, because allergies are an anomalies, we didn't evolve to be allergic to our own environments, it's really a big function of our immune system. It's so common, people think it's normal to be an allergic person, but it's not. Geoff: Right, that's actually interesting. Felice: But these mast cells rupture and they release histamine because it's part of the defense system of the body to fight off invaders, but it's malfunctioning, but histamine does that in the mast cell, but also in the brain it sets to memories. You're blocking histamine in your brain, it's like, "We can't do this. We cannot micromanage the body this way." We have to find better ways to help get the immune system right, but of course that starts from even preconception, because the immune system is developing in utero. Drugs can be life-saving. I look at drugs as a bridge back to health, but the problem is that a lot of the drugs are not looked at that way because the pharmaceutical companies don't make money if you use it for two weeks. They want you to use it for life. They make so much money like PPI's, the drugs that block acid production in the stomach. When they first came out, they were approved for two weeks of use, now people are on them for decades. It's like, "There's no data. You need stomach acid." It's like the stomach acid has been maligned. It's like no one wants stomach acid. You can't function properly as a digest ... You cannot digest without stomach acid. We need stomach acid and yet there are people that are put on it for almost no reason, and then they just stay on it, and now it's over-the-counter. They think it's over-the-counter it's safe, they don't realize it. Geoff: Well, I wanted to also talk about ... We talked a lot about removed toxins as one of your core tenets. I also want to leave time to talk about restore spirit. We didn't dive too much into that. I think we should cover at least that part. I wanted to understand what did you mean by that and ... What did you mean by that? Felice: Well, to restore the spirit involves many, many things. One, which is very important is to have people in your life who you love and who love you, because we know that without relationships that matter people just wither. You have to ... Say you're alone, like say you went through a divorce and your kids grew up and they moved away and you're really alone, then you have to find your new community. You have to create a community. You have to go out and you have to be just ... You have to take the steps, because if you're sit in your place by yourself no one's going to come to you. You have to find a cause, this helps to accomplish, the other thing is to have a purpose in life. A lot of times when people retire and they lose their purpose because their career is no longer there, then they die. We don't want that. Geoff: Don't we all have monkey brain? Felice: Well, I actually admit to it. Geoff: You have a especially monkey brain. Felice: For me, it's like I can't go where there's no thoughts in my brain. I can't. It's like too much trouble, and that's stressing me out. I have to clear my brain. I can't do it. Guided imagery teaches me to find a vision in my head, it takes me on a journey. It says with beautiful music and a beautiful voice, "I want you to picture yourself in a beautiful, safe place, either real or imaginary," and then it guides you through a journey. My brain is being used to put me in a certain place, and I happen, like I happen to be very easily hypnotized because all through my life I didn't understand it, but I would go into these trances. It's like, "Where are you?" It's like, "Oh, I don't know. I was like in a trance or something." I'd look out the window, the next thing I know I was in a trance or something, but now I found out that is not brain damage, that's actually good because they've shown that people who daydream, it could also be called daydreaming, you know. Geoff: That's what I was going to say, it's daydreaming. Felice: It's a daydream, that sounds better than going through a self-induced trance, it's like daydream, that you daydream, that it actually turned out to be often more creative and have better brain functions. It's not as bad as it seems when you're a daydreamer, but you do have to focus sometimes, but for me, that works the best, to do guided imagery, but there's so many other things. We also teach, in my office we teach tapping, which is also about the emotional freedom technique, where you do tapping. I love that for men, because men often they don't want ... they think it's like, "Woo, I'm going to listen to somebody taking me on a little journey." That's not ... it doesn't sound manly. Geoff: Data on meditation works ... is becoming more and more robust. I think people are seeing it. I think it's ... Again, I think it's all about the data. It's interesting, it sounds like this is more on the life coaching almost. It sounds like you're not just a primary care doctor for your patients, you're also serving as a coach and a guide in how to ... I think that's interesting to think about restoring spirit, because I absolutely see people when they lose their primary motivation of waking up in the morning, they just kind of wither away. I don't think that is, again overly pseudo ... it's not total woowoo, like you can actually feel someone just disconnecting from active life. Restoring that is as important as much as removing toxins. I think I absolutely agree with you there. Felice: It is. It is very, very important. Dealing with stress and having quality relationships are so important. I even recommend, for example for people who live alone, they really don't touch other people, that they should regularly have massages, because we know that just the human touch, and they've done this like ... They have done studies with babies, what they call healing touch, they take premature babies and they do this little touching thing, with the touching the baby. Because often the babies are put in the incubators and they're just looked at as little things that you don't touch. We don't want to touch them, we might contaminate them or something. Felice: They're just left there, but they take those little babies and then they do this little touching thing, that they find that their stress hormones go down, that their breathing slows, their heart rate slows. Geoff: Like oxytocin goes up with a human touch, right? Geoff: Almost like a head massage. Felice: Like a massage. They feel so good just to get that touch. I encourage that, and then go and get regular massages. People need human touch and they need the emotional, and this is as important as eating food. It really is, this part of restoring the spirit, restoring health. It's very important for brain health because we know when people feel sad that changes their brains. Sadness is terrible. These are so many important things, and we live in a world where so many people do live isolated lives, their families are disconnected, living all different places, and then we take elderly people and then we put them into assisted living facilities and things. Everybody needs connection and purpose through their whole lives. I like to think that I've gone through chapters in my life. I'm in this chapter and hopefully they'll be another chapter that I'll do, but everyone has to morph as they age. Like a lot of surgeons, and I was a very prolific surgeon, I still do surgery but nothing like what I used to, and I only do little outpatient surgeries. I don't want to do the big inpatients ones anymore, but a lot of surgeons when they reach a certain age, like say in their 60's they don't really feel like they want to do the surgery, and then they lose their sense of direction like, "Who am I if I'm not operating on people?" You have to actually think about this ahead like, "What else am I passionate about? What else can I do?" I have one friend who's a surgeon, and he loves cooking and gardening. He doesn't do surgery anymore, but he is creating life in his backyard. Geoff: He's a master chef. Felice: He's a chef and he creates dishes and recipes, and he's in with the ground and he's growing things. That's creating life, plant life. That's giving him great joy and he's earthing in the same process. Geoff: It sound like you're in the prime of your current phase, but I'm kind of curious to hear about in the future what would be the next phase for you? It sounds like you've already transitioned a couple phases, what else is interesting on your radar? What are you looking at? What is most exciting for you moving forward? Felice: Well, I love teaching. For many, many years I was assisting clinical professor at USC, but I was teaching surgery, but I'm not doing that now, but I love teaching so I'm on the lecture circuit. Next month I'm going to be doing a two-day program on women's health in Dubai, and then I'm speaking in India in February. I'll be speaking in London in June, and in between I will be doing other, I have like four webinars that I will have coming up. You can find me probably on the internet with different webinars that I've done. Geoff: How can our listeners find you? Do we have a webpage or a speaking tour or a Twitter that you can shoutout and we can have ... that we can come and find you and follow your work? Felice: Well, I just started doing Twitter about two months and I have a pretty good following for just two months. For that it's @DrFeliceGersh, it's pretty easy, just D-R, doctor D-R, and then my first name and last name. I don't know if it matters, but the D, the F, and the G are capitalized at least the way I see it. Felice: I don't think it matters, that's so much I know about social media. I have a website for my practice, which is @integrativemgi, M-G-I standing for Medical Group of Irvine, Integrative Medical Group of Irvine. Then I have my own little personalized one, in anticipation of having a book written and published, hopefully by a year. It's been a project that just hasn't quite gotten completed over time, I've just been busy, but I'm hoping to have a book out in the year and that is felicelgershmd, that's an easy one too. Those are my main social medias. Geoff: We should ... I'm excited to hear about the book and the speaking tour. We should definitely can see the conversation once those are out, but I think I really enjoyed this conversation because, one, and I think we talked about this before, that in the space of biohacking and really being thoughtful of quantifying human performance, we don't have ... We would like to see more thought leaders that are women, that understand women's issues to be more proactive and out there and prolific. I think for better or for worst, it just seems to be, I guess, stereotype is like a very tech, bro or a guy can do, but I don't think ... I think if you look at our community groups it's literally half women, and I think it's awesome that we have you on this program to really share your expertise around the data and research on women. I think more people should be doing research in the space, because if you look at a lot of clinical trials, they're done on just men, and for a lot of psychology studies they're done on just college aged psychology students, because those are the easiest sample of people to do studies on. It is refreshing to hear about the data done on women, the focus on results and metrics for women. I appreciate you highlighting these issues, and I think we definitely want to link to them. For the folks out there, that are interested in applying some of your practices and techniques, they can definitely look those up and look you up online. Felice: Absolutely, and I'll be also, actually in a few hours I'll be flying to Las Vegas for the 25th Anniversary Meeting of the American Academy of Anti-Aging Medicine. I'll be speaking there and I have two lectures coming up. I will spread the word about your podcast to come to, and I'm going to try to educate. They have a lot of new doctors, who are just like, just breaking out and trying to learn. It gives me a chance to educate the doctors, who are hopefully going to be the future thought leaders and change the paradigm of what healthcare really is, and to turn it to what it should be. Geoff: That's good news. I think that's how you scale out your thinking mindset. If you can amplify and have some of your experience spread out to the future doctors you can touch, and hopefully a hundred of min-Felice's out running around. If that's what it takes, if we really want to change how healthcare is thought about, well, we have to target, one, the people that are actively practicing medicine, and then two, educating the everyday patient how to be a little bit more self-aware and armed, and knowledgeable about their own performance and health. Felice: Well, Geoffrey, you hit it right on the head, that is exactly what my mission is for this next chapter. I still have been seeing patients most days in the office, but I'm trying to spread my legacy by having more impact in the wider society as a whole. Geoff: Absolutely. We'll have to have you back on the program, but I appreciate this conversation, and we'll have you on soon again. Thanks so much, Felice. Felice: I would love that. Thank you. Felice: Have a good day. Geoff: Take care. That was a really fun conversation with Dr. Gersh. I actually ... She just has such a great vibrant energy and clearly so passionate about the space and helping patients. I think those are the voices that we like to highlight on our program, and I think something that ... and it gives me just added energy. I think, Zhill, our producer was listening on the conversation, I think it was, again, so important to have diverse voices and serious voices that are just so passionate at helping people. We'll definitely have her back on the program, and as we're wrapping up we're planning to do an event, in-person events in 2018, and I think she will be a good person to be giving a keynote there. As always, we love the questions and the feedback for this program, so send us a note. Zhill will see all those messages. I'll see all those messages. I'd love to improve and to continue providing good content and education for our community here. As always, find us on iTunes, Google Play, SoundCloud, and YouTube. Geoff: Also, Spotify, as Zhill mentioned. We just ... We're officially approved as an official Spotify podcast. Our audience is growing phenomenally, I think we literally are growing like 30% month over month now, which is huge. I think it's been funny because I've been seeing people just at cafes, and people have come up to me saying like, "Oh, I like your podcast." It's really rewarding to both Zhill and I, to hear the traction and growth of this podcast. I appreciate the support and share out the podcast, we think this is good. Until next time, Geoff is out. Peace. Find and subscribe to the HVMN Enhancement Podcast on iTunes and Youtube.